Pet sitter savagely attacked by Bear! Caught on camera! OMG! Pet sitter savagely attacked by Bear! Caught on camera! OMG!. 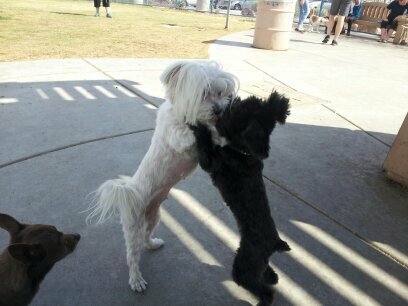 This is Bear the Toy Schnauzer having fun at Kellogg-Zaher Dog Park. She’s the cutest toy Schnauzer in the World. Houston Dogs save family from house fire! Not a day goes by that Dogs somewhere someplace does a valiant brave thing to rescue us. They are truly Mankind’s Best Friend! Summerlin Dog Sitting: 5 Things Dogs can sense about you! Dogs can hear much better than us, Dogs can see much better than us, Dogs can smell much better than us and now it’s been proven they can sense things about us. Why there are shelters and pounds in America I’ll never know! Remember Dog spelled backwards is God! Cat walks Dog on leash! A SuperStar Pet Services Pet Alert! Coyotes have been attacking pets in The Las Vegas-Henderson area. Pet Sitter Summerlin. Amazing story of True Dog Love! This is a must read. Dogs never cease to amaze me!